I took this photo on a whim, just to see how it would turn out. 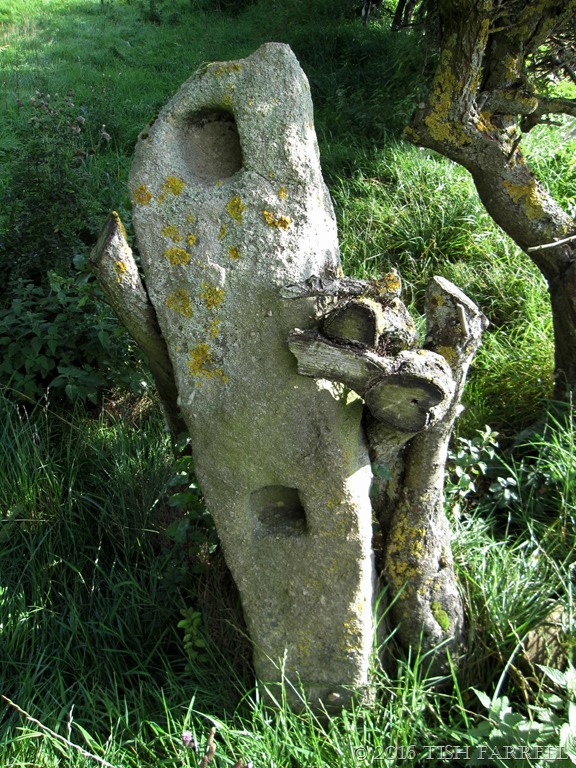 This old farm-field post was one of several on the footpath to the Hathersage stepping stones that cross the River Derwent just outside the town. For those of you who read my earlier Derbyshire posts, you’ll know I was on a quest to follow in my great grandmother’s footsteps, taking the path that she once took from Callow Farm and into Hathersage. I don’t remember ever seeing stone posts like this before, and don’t know how old it is. But I think it’s safe to say that this and others were there in the late 1880s-90 when Mary Ann Fox passed by to do her shopping. There was also another idea running through my head when I took the photo – a far cry, too, from Derbyshire and my ancestors. 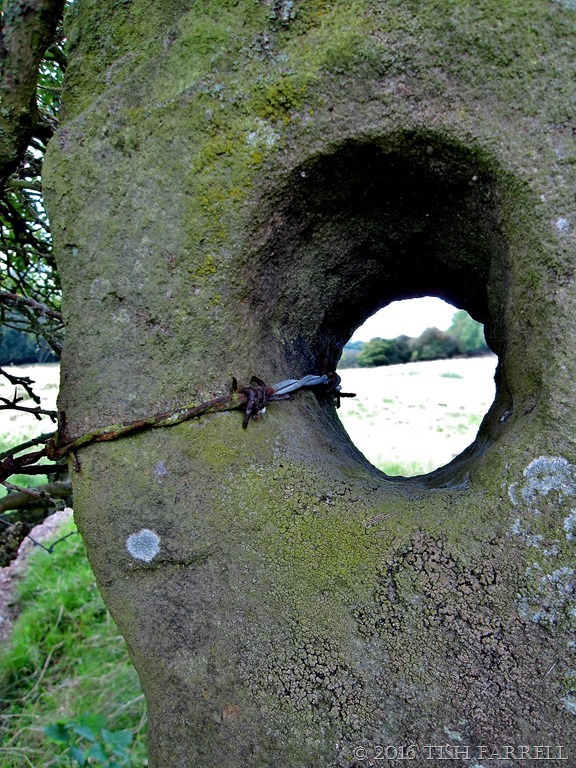 When I saw the hole in the stone I was reminded of the 1960s young adult novel The Owl Service by Alan Garner. It is set in Wales and explores the rival affections between three teens through a parallel tale from the Welsh medieval story cycle of the Mabinogi. It’s a great story, both the original and Garner’s use of it. Here’s a quick version of the myth. The magician Gwydion makes a woman, Blodeuwedd, from flowers. She betrays her husband Lleu with a man called Gronw who tries to kill Lleu with a spear. He turns into an eagle and escapes. However, rough justice allows Lleu to have his turn to throw a spear at Gronw who may only use a stone for protection. Lleu throws the spear so hard, it passes straight through the stone and kills Gronw, and to punish Blodeuwedd for her part in all this, the magician Gwydion turns her into an owl. So the first shot is my photo version – the stone of Gronw. Posted on November 3, 2016 November 3, 2016 by Tish Farrell	This entry was posted in Family History, photography and tagged Callow Farm, Derbyshire, Hathersage, Mabinogi, Mary Ann Fox, Thursday's Special, Tish Farrell Writer. Bookmark the permalink. Oh, brilliant….I am a great fan of Alan Garner – Elidor entranced me as a child. Well done for adding this association to your image! Glad you liked that, Sue. Have you read Garner’s grown up books – Boneland and Thursbitch. I love the way he blends the tales of ages into his present-day landscapes, and gives the ancestral past its due respect. 🙂 I love the choice for the theme – old stones whose age we are never able to establish. I will look at owls differently from now on 🙂 Lovely post, Tish, and yes, the photo turned out well. I adore this photo both for the subject and for the perspective you chose! A magical blend of myth and image Tish, lovely! Love it. Those stones look super old. Glad you’re having a great time and thanks for sharing! The barbed wire somehow personalized the stone – someone obviously put it there purposefully. You tell a number of tales here and untwist the connections beautifully. I’ve never come across stone fence posts before. You also remind me of the pleasures of Garner – I’ll have to track his grown-up books. Makes me feel old – they were part of my children’s childhood. Garner’s Boneland is actually the third part of the children’s book Weirdstone of Brisingamen etc though very much a grown up book. I thought it a very brave move on his part to do this. It rather releases one’s childhood self and takes it into very strange dimensions – in mind and in outer space. A slim volume too. Wonderful weave of reality with fantasy, Tish. You mentioned your quest to follow your great-grandmother’s footsteps. When I was in Corinaldo last spring, I had the same sense, that I was walking down the same village streets that my grandfather and his parents once walked. It was truly a memorable experience.